Inexperienced and experienced drivers in Anderson, SC can prepare for a car accident in many different ways, carrying an emergency kit, emergency flares, and other safety tools is one way. However, no one can truly ever prepare for the physical and mental repercussions of the event. Some drivers do not even know what to do after a car accident. Most accidents leave motorists and passengers shocked, stunned, and often thinking that it came out of nowhere. Although some can brace for impact, many are blindsided by the incident. It is estimated that a driver will be involved in a car accident once every 18 years which means that an average driver could be involved in at least three accidents in their lifetime. In South Carolina, the Department of Public Safetys most recent traffic collision fact book notes that an accident occurred every 5 minutes and one person was injured every 10.9 minutes in a car crash. If you or a loved one has been injured in a car wreck caused by a careless driver, the victim may be entitled to compensation for property damage, medical expenses, lost wages, and more. Our Anderson car accident lawyers can help you get the justice you deserve. Fill out the Free Case Evaluation form to your right for a 100% FREE, no-obligation review of your auto accident claim its strictly confidential. After a car accident there are many general actions to take such as calling 911 immediately if anyone needs assistance. Calling law enforcement is another general step to take in order to file a police report. If possible move away from the accident scene and/or traffic. Other negligent drivers may not see the initial accident and could crash into the scene further injuring motorists. If a car cannot be moved drivers and passengers should remain in the vehicle with seat-belts fastened, make sure to set the hazard lights on. After the police and emergency services have been called, exchange insurance and contact information with the other driver(s) involved in the crash. When the police officer is filing their report share only the facts of the accident; do not admit guilt nor blame the other driver as it could complicate the situation. Record the scene with your cellphone or camera. Make notes of what you remember such as what speed you were traveling at, what direction you were headed in, weather conditions, and other important information. Ask for contact information from pedestrians or other witnesses that may be able to verify how the accident happened. If you receive medical aid make sure you keep copies of receipts, diagnosis, and contact information of those who treated your injuries. If possible retain images of your injuries as well. Filing a claim with your insurer may be your next step, however, before filing an insurance claim you may wish to contact a lawyer in order to determine if you may be entitled to further compensation. Although insurance companies often do their part to help with vehicle repairs and injuries sustained, they may not provide adequate compensation. Additionally, never sign any paperwork at the scene of the accident unless is a police report. 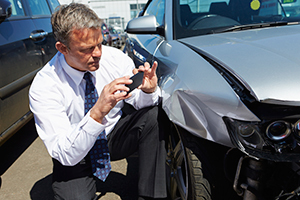 Insurance adjusters may arrive to the scene of the crash in order to hastily file and close a claim, however, they may be low-balling you on repair work and medical coverage. At Harbin & Burnett we know and understand the tactics insurance companies often use to protect their own assets rather than the rights of car accident victims. If you or a loved one has been injured in an auto accident caused by a careless driver and you are seeking legal counsel, our lawyers are ready to help you. We can provide professional and protective representation to those who have been injured in an accident and are committed to helping you get every dollar you deserve in the minimum time possible. We have extensive experience in negotiation and litigating and will help to guide you through the legal processes. We are a full-service car accident law firm in Anderson, South Carolina. If you are still recovering our lawyers can come to you as we offer free home and hospital visits. Contact us today at 1(888)821-0247 to discuss your claim at no-cost* and no-obligation. One of our intake staff members will connect you with one of our lawyers best suited in handling your claim. Alternatively, contact us online by filling out the Free Case Evaluation form at the top right hand corner of this page its 100% FREE to submit.